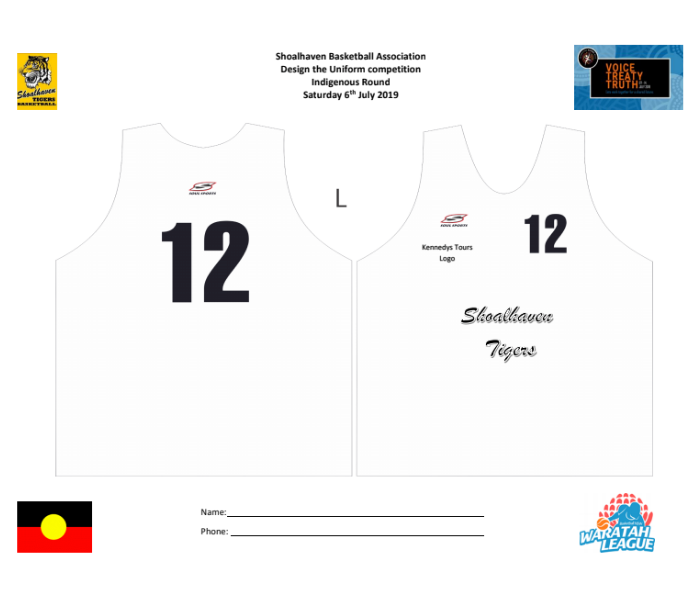 Shoalhaven Basketball Association (SBA) Incorporated is a not for profit sporting organisation that has been established now for 60 years in the Shoalhaven. SBA has a rich history of indigenous members with in its organisation including teams, players, coaches and referees (the likes of David Bloxsome (Referee), Gregory Seymour (Player / Coach), James Stewart (Player) Jodie Wellington (nee Wright) (Player) and the Summer cloud Wanderers (Team). The uniform should Include Natural Culture landscape significant to Aboriginal people. Please note: The Shoalhaven Tigers name will be placed on the front of the singlet along with major sponsor logos. Entries close at 5pm on Monday 6th May 2019. The winner will be announced on Monday 13th May 2019 on the SBA Website and notified by phone. The winner will be presented with a cheque to the value of $200.00 at the Indigenous Round scheduled for Saturday 6th July 2019 at the Bomaderry Basketball Stadium (The Tigers Den) times to be confirmed once winner is announced.